INTRODUCTION § Forestry involves protection of forests and farming of trees to ensure continuing timber supply. § A forester cares for the forest resources by protecting them from fire, pests and diseases and encroachment. 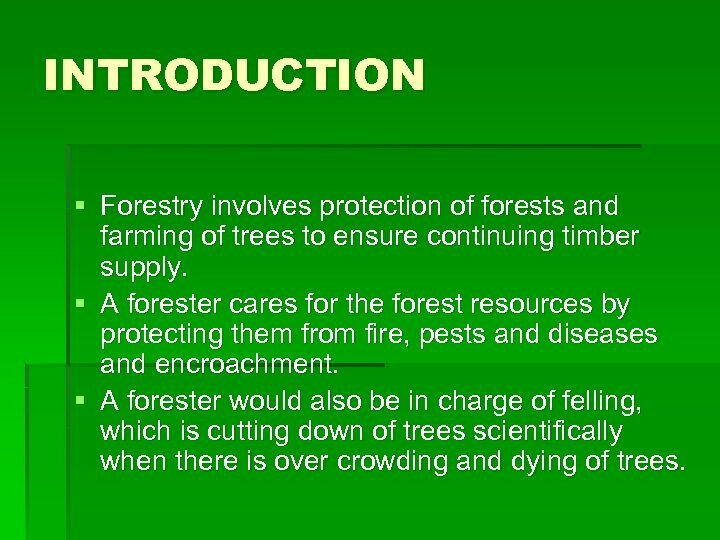 § A forester would also be in charge of felling, which is cutting down of trees scientifically when there is over crowding and dying of trees. 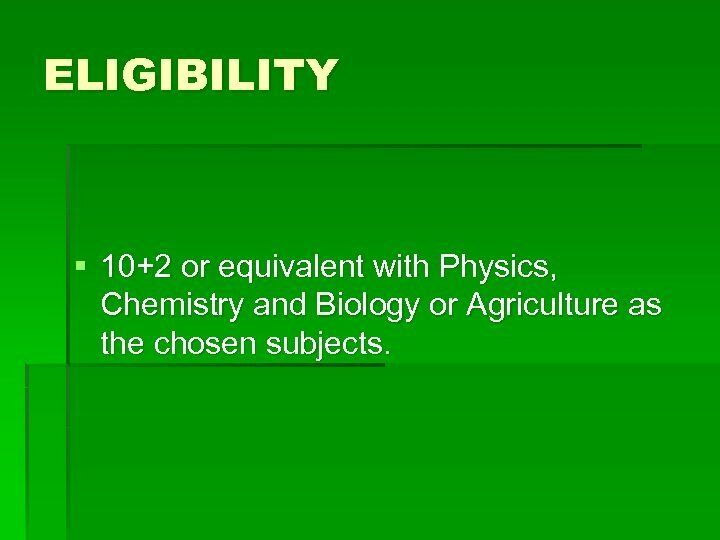 ELIGIBILITY § 10+2 or equivalent with Physics, Chemistry and Biology or Agriculture as the chosen subjects. 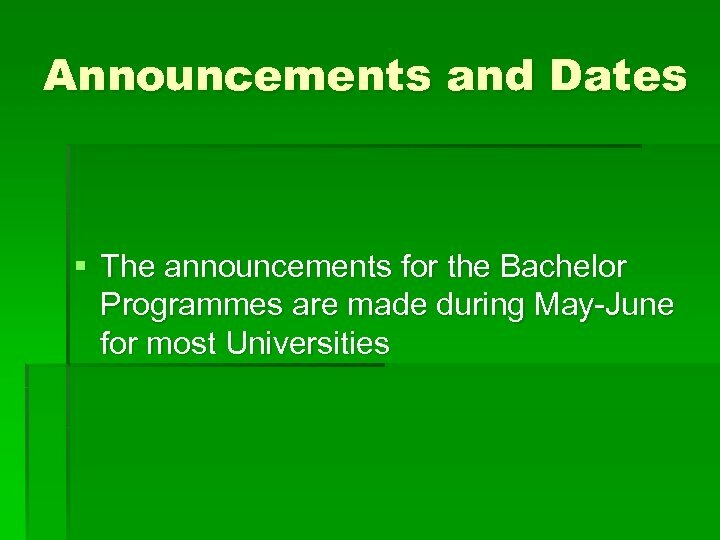 Fees § Bachelor Programmes at the Universities cost between Rs. 2000/- to Rs. 4, 000 for tuition per year. 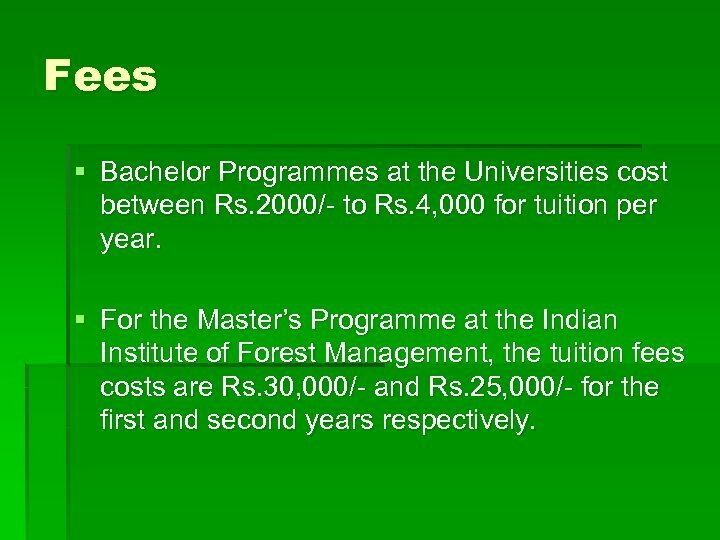 § For the Master’s Programme at the Indian Institute of Forest Management, the tuition fees costs are Rs. 30, 000/- and Rs. 25, 000/- for the first and second years respectively. 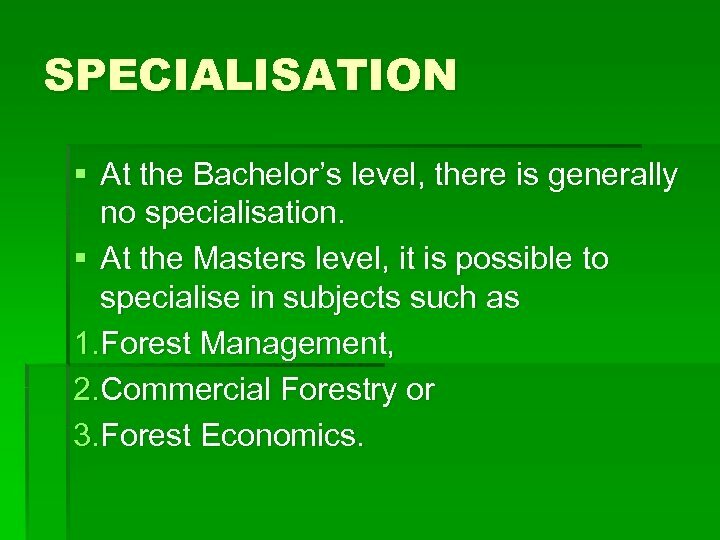 SPECIALISATION § At the Bachelor’s level, there is generally no specialisation. § At the Masters level, it is possible to specialise in subjects such as 1. 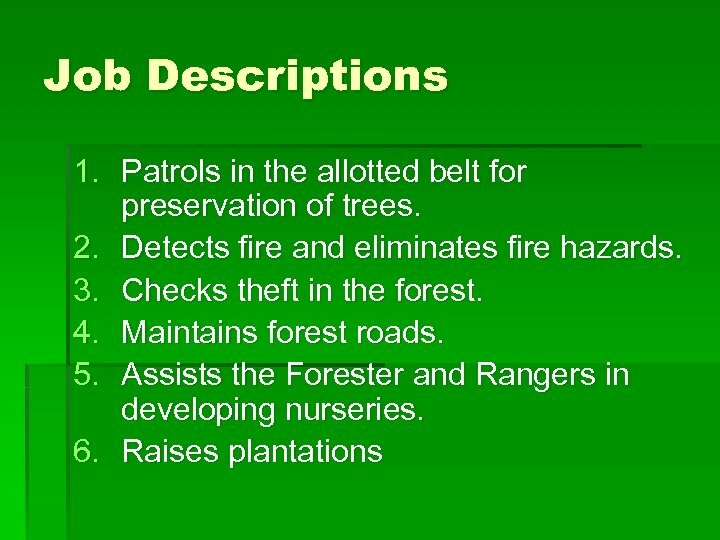 Forest Management, 2. 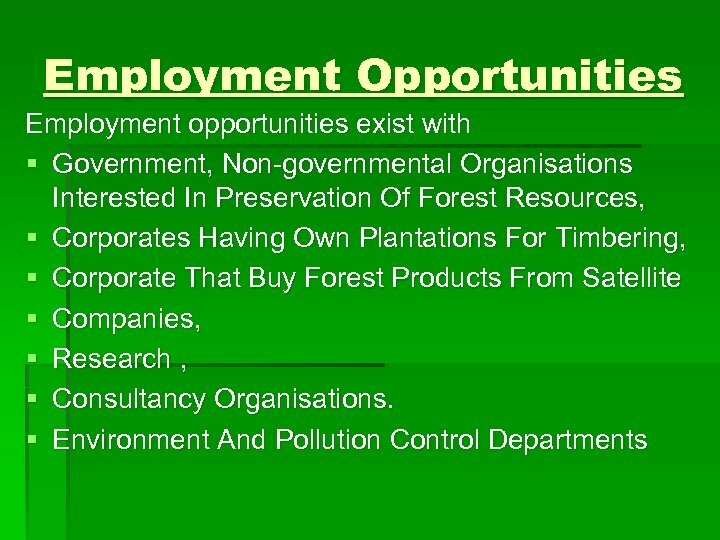 Commercial Forestry or 3. Forest Economics. 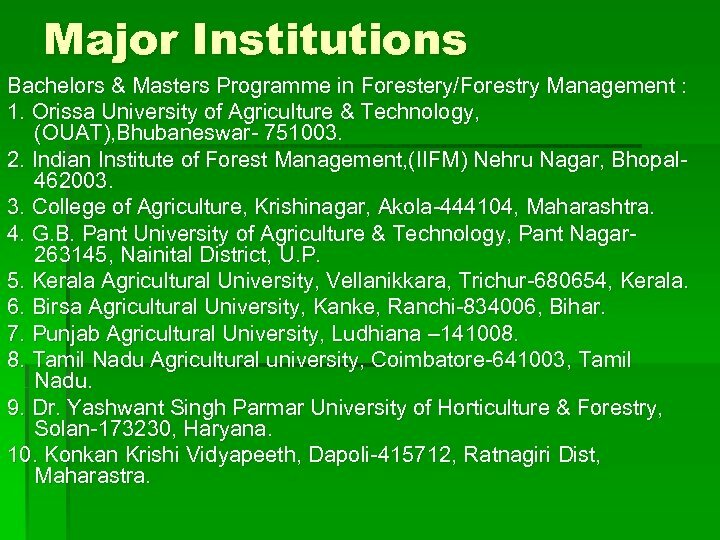 Major Institutions Bachelors & Masters Programme in Forestery/Forestry Management : 1. Orissa University of Agriculture & Technology, (OUAT), Bhubaneswar- 751003. 2. Indian Institute of Forest Management, (IIFM) Nehru Nagar, Bhopal 462003. 3. College of Agriculture, Krishinagar, Akola-444104, Maharashtra. 4. 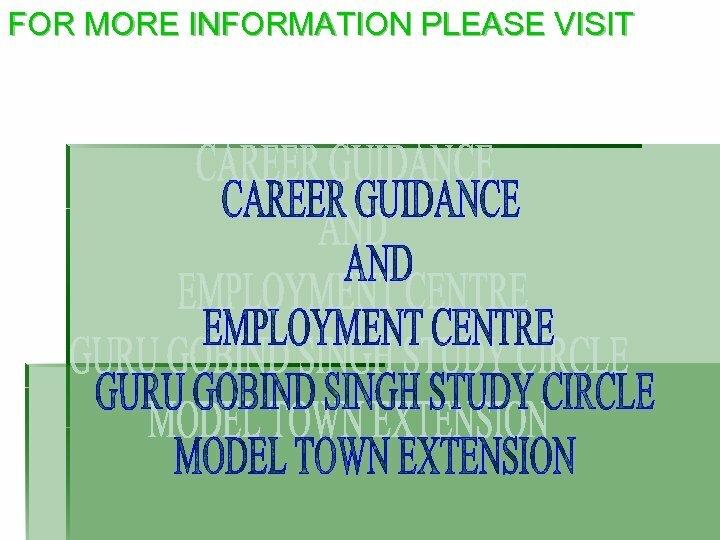 G. B. Pant University of Agriculture & Technology, Pant Nagar 263145, Nainital District, U. P. 5. Kerala Agricultural University, Vellanikkara, Trichur-680654, Kerala. 6. Birsa Agricultural University, Kanke, Ranchi-834006, Bihar. 7. Punjab Agricultural University, Ludhiana – 141008. 8. Tamil Nadu Agricultural university, Coimbatore-641003, Tamil Nadu. 9. Dr. Yashwant Singh Parmar University of Horticulture & Forestry, Solan-173230, Haryana. 10. Konkan Krishi Vidyapeeth, Dapoli-415712, Ratnagiri Dist, Maharastra. 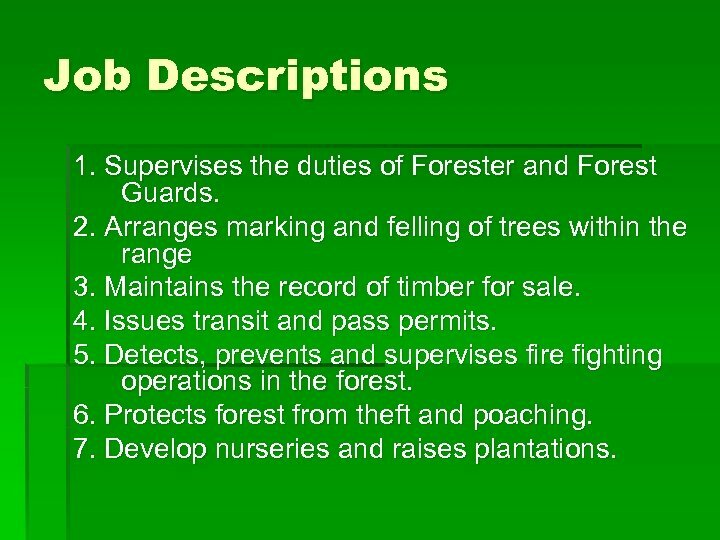 JOBS IN FORESTRY § Forests contribute significantly to the economic development of a nation. § In this era of environment consciousness, forests need to be protected, maintained and developed. § Hence there is need for trained personnel who looks after the job. 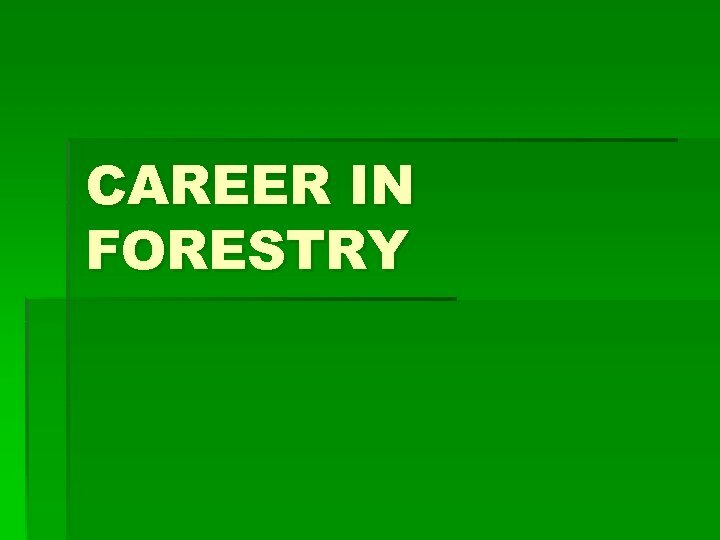 § A career in forestry is both adventurous and challenging. FOREST RANGER Qualification required : § Science Graduate/B. Sc. (Ag. ) § Scale of Pay : 5000/- plus allowances § Age : 18 to 32 years relaxable as per rules. 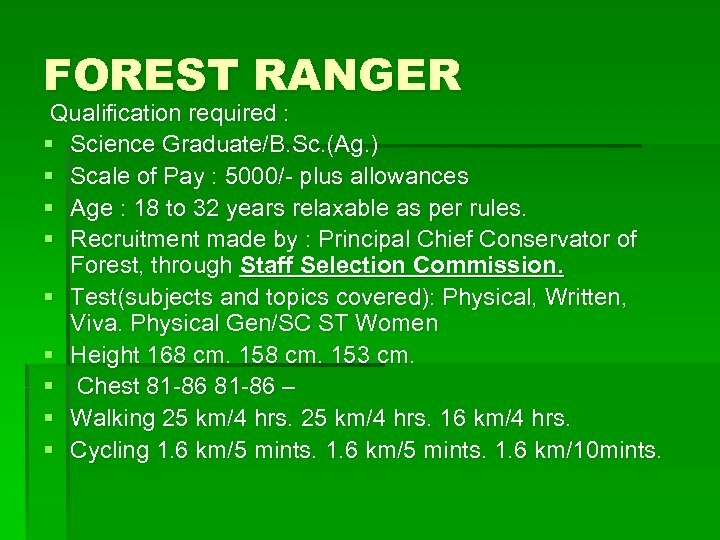 § Recruitment made by : Principal Chief Conservator of Forest, through Staff Selection Commission. § Test(subjects and topics covered): Physical, Written, Viva. Physical Gen/SC ST Women § Height 168 cm. 153 cm. § Chest 81 -86 – § Walking 25 km/4 hrs. 16 km/4 hrs. 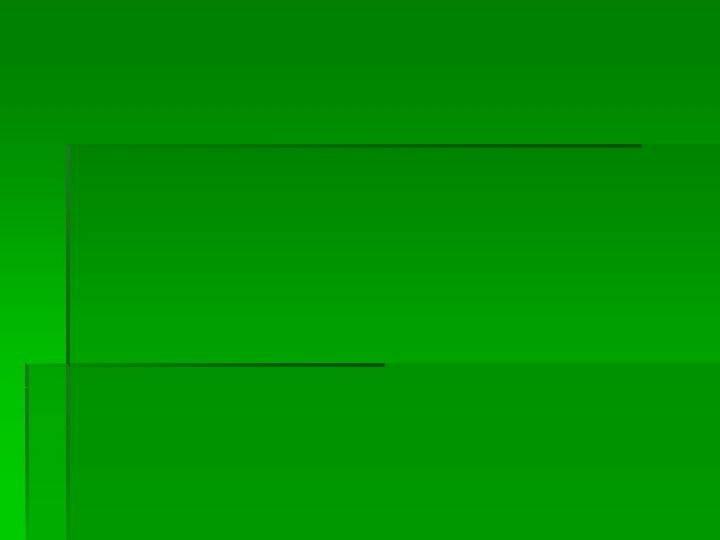 § Cycling 1. 6 km/5 mints. 1. 6 km/10 mints. Promotional Prospect § Asst. 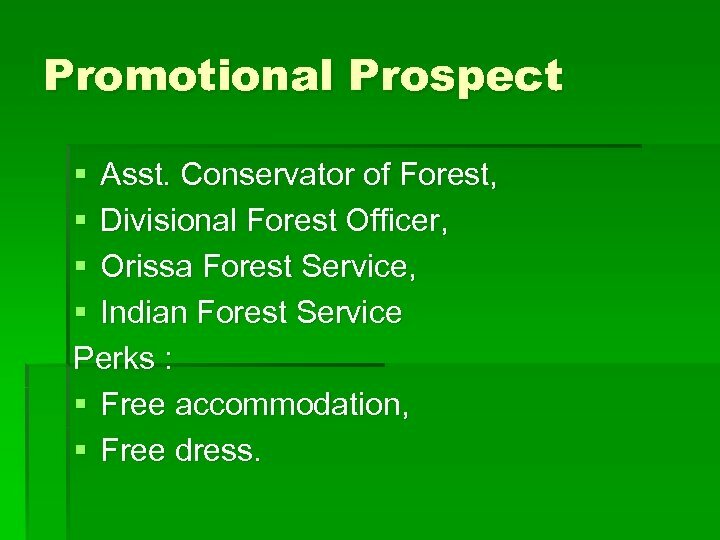 Conservator of Forest, § Divisional Forest Officer, § Orissa Forest Service, § Indian Forest Service Perks : § Free accommodation, § Free dress. Job Descriptions 1. 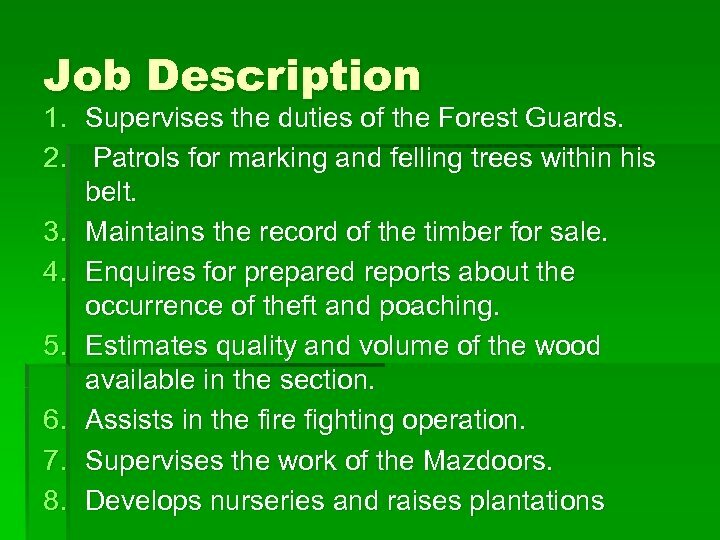 Supervises the duties of Forester and Forest Guards. 2. Arranges marking and felling of trees within the range 3. Maintains the record of timber for sale. 4. Issues transit and pass permits. 5. Detects, prevents and supervises fire fighting operations in the forest. 6. Protects forest from theft and poaching. 7. Develop nurseries and raises plantations. 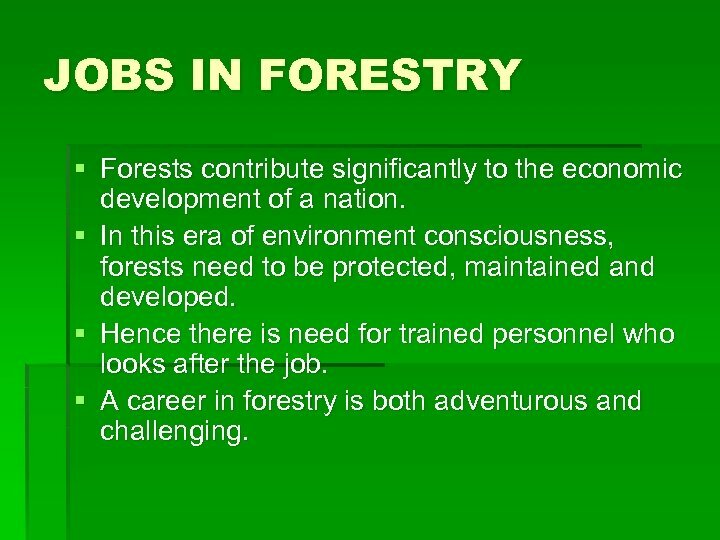 FORESTER Qualification Required : Intermediate in science. § Scale of Pay : 3200/- - 4900/§ Age : 18 to 32 years relaxable as per rules. § Recruitment made by : Divisional Forest Officer of the District/Division. § Test : Physical, Written, Viva. Physical Gen/SC ST Women § Height 168 cm. 153 cm. § Chest 81 -86 – § Walking 25 km/4 hrs. 16 km/4 hrs. § Cycling 1. 6 km/5 mints. 1. 6 km/10 mints. Promotional Prospect 1. Rangers, 2. D. F. O. Perks : § Free accommodation, § Free dress. 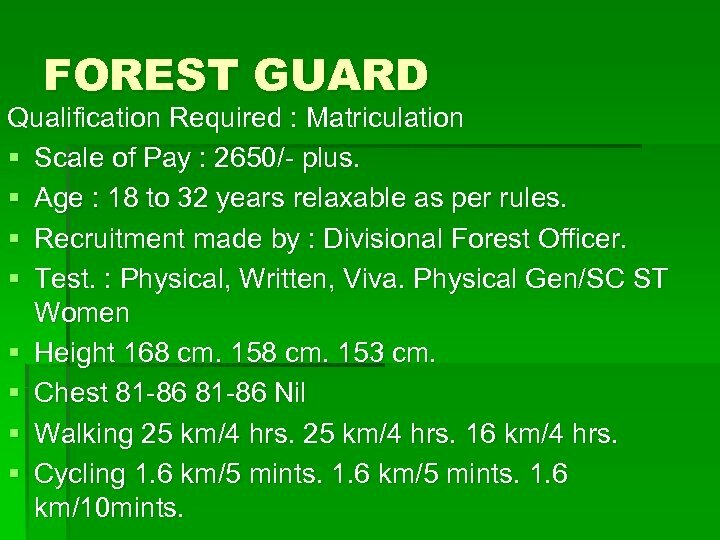 FOREST GUARD Qualification Required : Matriculation § Scale of Pay : 2650/- plus. § Age : 18 to 32 years relaxable as per rules. 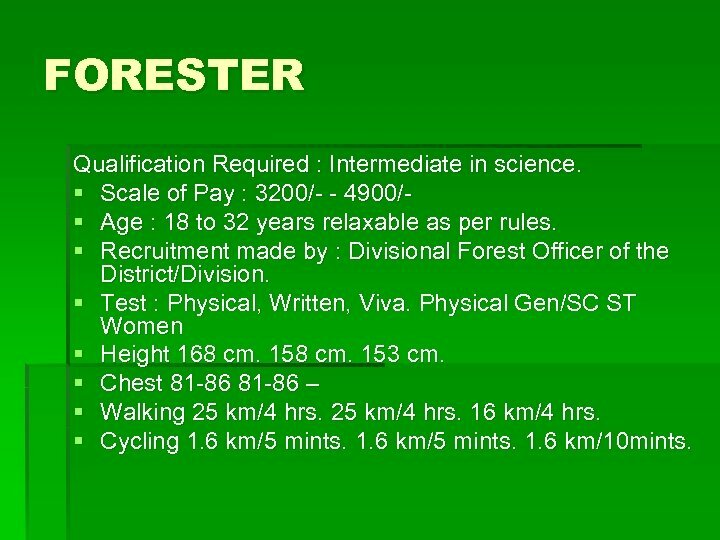 § Recruitment made by : Divisional Forest Officer. § Test. : Physical, Written, Viva. Physical Gen/SC ST Women § Height 168 cm. 153 cm. § Chest 81 -86 Nil § Walking 25 km/4 hrs. 16 km/4 hrs. § Cycling 1. 6 km/5 mints. 1. 6 km/10 mints. Promotional Prospect 1. Forester, 2. 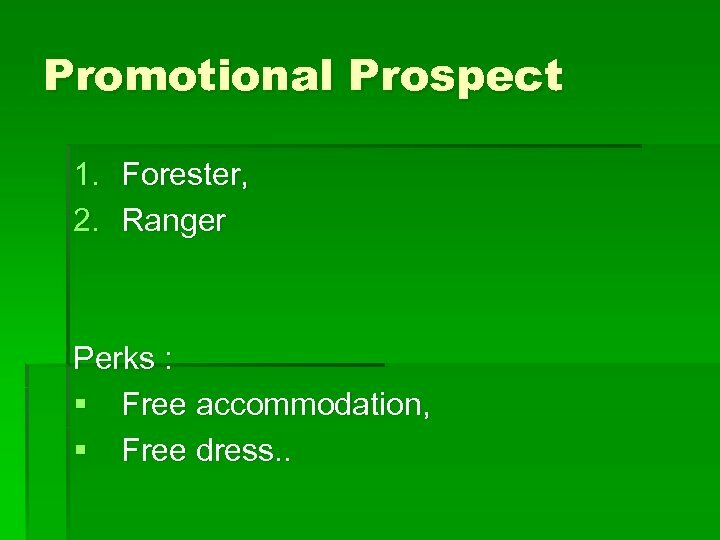 Ranger Perks : § Free accommodation, § Free dress. .
How to Choose a Career Path ? ?